Solving a linear inequality means finding a value for x that makes the inequality true. 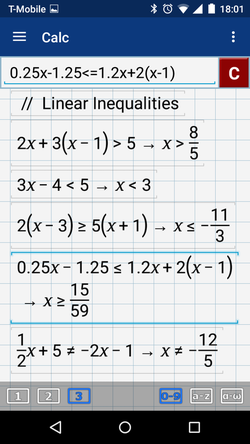 ​Enter the inequalities as given in the problem with one inequality per line. 1) Enter the expression: 2x + 3(x – 1) > 5. 2) Enter the expression: 3x – 4 < 5. 3) Enter the expression: 2(x – 3) > 5(x + 1) as "2(x – 3) >= 5(x + 1)"
4) Enter the expression: 0.25x – 1.25 < 1.2x + 2(x – 1) as "0.25x – 1.25 <= 1.2x + 2(x – 1)." 5) Enter the expression: 1/2x + 5 ≠ –2x – 1 as "1/2x + 5 <> –2x – 1."